What is SaaS? We seem to need to ask this question every couple of years, because the answer is a bit of a moving target. It was simple enough when SaaS was merely software applications pushed through a Web browser, but now we have to contend with the cloud, mobile and even social. Recently, Scott Maxwell of OpenView partners sparked an interesting debate on the topic on LinkedIn that got me pondering it again. I’ve weighed in on the “What is SaaS?” question before, however, every time I encounter this debate, I can’t help feeling that it skirts the more important issue: Why SaaS? When trying to create a successful SaaS business model, being SaaS is interesting, but doing SaaS is essential. 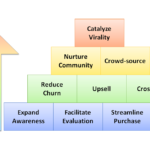 It’s far less important that your SaaS business model meet the exact definition of SaaS, than it is that your SaaS business model creates sustainable competitive advantage through SaaS. Why be SaaS in the first place? Why not just be software? At any rate, this recent debate got me to re-reading some of my old blog posts on the topic and I realized that they were very text heavy and could use an upgrade. So, in this post I revisit the topic of “Why SaaS?” with a short visual tour of SaaS business model basics. At the risk of repeating myself, I will repeat myself. The only difference between software and software-as-a-service is that SaaS is delivered over a standards-based network called the Internet. Therefore, all new economic value and competitive advantage must flow from this difference. Yes, it’s a mouthful. So let’s look at some pictures. 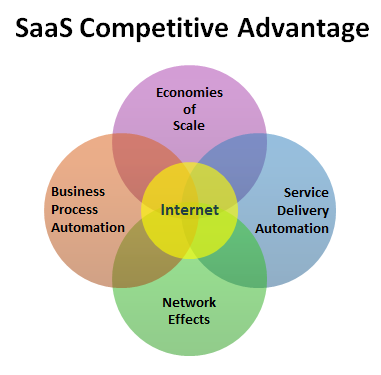 Competitive advantage in the SaaS business model comes from leveraging the customer-vendor network connection to reengineer business processes and service delivery, while building a large customer base to create economies-of-scale and network effects. 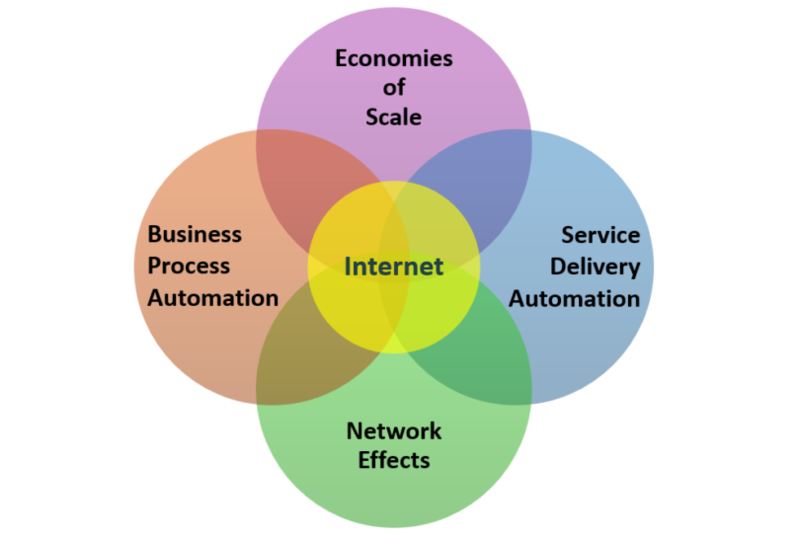 SaaS begins and ends with the Internet. The first impact the Internet has in SaaS is to connect the customer to the SaaS business through the product. Let’s think about that for a minute. How many products do we use everyday that can make this claim? One. SaaS. More and more, we are seeing other products, such as automobiles, security systems, and even clothing incorporate SaaS, but it is always the software communicating over the Internet that makes the connection between the customer and the vendor. The SaaS business model connects the customer to the SaaS vendor through the product, disrupting the value chain by automating and shifting work between the customer and the SaaS business. between the customer and the SaaS business over the network. Self-service customers do work previously done by the software vendor. Managed service customers outsource unwanted tasks to the vendor over the network. And, smart SaaS business models aim to automate it all. The most obvious example is the work of deploying and maintaining the software itself. Whereas maintaining on-premise software is labor-intensive for customers and vendors alike, the best SaaS products are deployed instantly and maintained invisibly using a high degree of network-enabled automation. 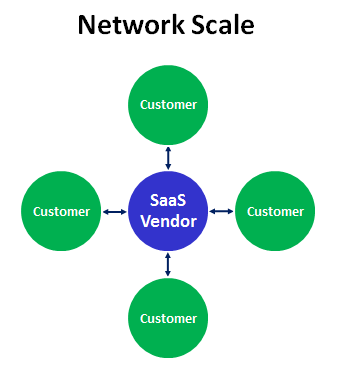 The network connection between the customer and the SaaS vendor creates huge economic value, but it pales in comparison to the value created when the SaaS business model scales to hundreds, thousands or even millions of customers. Lower total cost of ownership (TCO) in the SaaS business model arises from the combination of network automation and economies-of-scale. 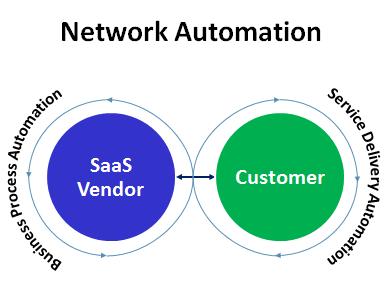 Network automation enables the SaaS vendor to service not just one customer, but many customers from a single infrastructure. With each new customer added, the average cost of operating that infrastructure is reduced for all. When you ask “What is SaaS?”, it is easy to get hung up on things like multi-tenancy, virtualization, and so forth. When you ask “Why is SaaS?”, there are no such concerns. 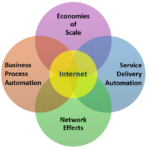 What matters is uniform, automated infrastructure and scale. Unlike on-premise software, the SaaS business model creates huge economies-of-scale by servicing many customers from a single, integrated infrastructure. 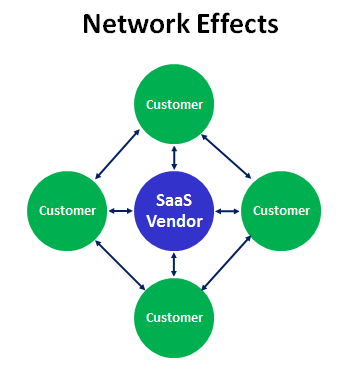 The final piece of the SaaS business model puzzle falls into place when we look beyond the customer-vendor connection and consider the potential of customer-customer connections: network effects. Sharing, collaboration, crowdsourcing, and benchmarking offer unique differentiation over on-premise software in the SaaS business model. They simply cannot be done without the Internet. The connection between customers enabled by the SaaS business model offers unique opportunities for differentiation. The technological “what” of SaaS is a moving target, but the economic “why” is enduring. The cloud, social and mobile have not displaced SaaS. The cloud has expanded the opportunity for SaaS competitive advantage through economies-of-scale. Cloud computing enables entirely new technical architectures that deliver as much or more savings as multi-tenant databases. In turn, social and mobile have expanded the opportunity for SaaS competitive advantage through network effects by creating that many more opportunities for customers to interact with other customers. Understanding “What is SaaS?” may help you explain your business to the analysts, but understanding “Why SaaS?” will ensure you leverage the SaaS business model for all its worth, today and tomorrow. There seems to be overlap and I’d love your thoughts. The focus of the model is less enterprise advantage (as it looks like you are focused on). You can simply gift your kid with a nice summer camp and that too without making your pocket unhappy. to toning up quick and stripping off body extra fat. and goals your child and you want to gain from a summer camp. camp lesson to practice texture or to draw a still life or leaves. and flexibility to individual needs and capacities. Full of wildlife and indigenous plant life there is always something amazing happening in New England. For kids that show a big interest in cooking, sending them to an overnight camp or day camp that involves cooking is a great idea. Camp Broadway offers classes in singing, dancing and theater arts led by Broadway-trained teachers. to pay. A good place to start is with bulletin boards in your local area or with phone book listings. will be the one is whose task is to install and repair various plumbing systems. The problems of leaking fixtures in faucet pipes, running toilets or clogging of sinks can be commonly seen in any household. future problems and to make sure everything runs smoothly. painters, and masons, and equipment such as scaffolding, safety helmets, and gears. the field. Hence, by detecting and repairing the leak at an early stage, we can save water, our building, money and water for future generation. once the tan has developed. chlorine causes discolouration and a change in hair texture. Choosing a camp with some sort of a nature or environmental science theme has several benefits including:. # 3 Summer Day Camp in Norfolk County, Massachusetts: Skyhawks. people per square meter, meaning that they cannot even lie down to sleep. Why should you consider Push in fitting boot camps. mirror image the letters these will transfer backwards. A days-only transfer remote island the thriftiest cheap year camp plan. They can start to define shapes through line, texture, light and shade. Kapoor also points out other benefits to an actual restaurant. it is a good method to work out for a comfortable retirement. You can spruce up the interior of your home by cleaning your carpets on a regular basis. And through these portals one can sell their old belonging in case any buyer is interested. minds with a truckload of twaddle about fairness and equal opportunity. s: Land does not depreciate for income tax purposes. services incurred are deductible, either on Schedule E (rental property) or Schedule A (property for resale). Purchasers are granted ownership as either as a “Time-share Estate” or as a “Time-share Use. -Don’t Press Down on the Burgers When Cooking: This compresses the meat, making it denser, and also squeezes the juices out of the meat. to your dermatologist for any advice or try a different acne skin care product.